Last week, Pew Research Center released its first in-depth study of online harassment among American adults, which examined the prevalence of harassment online, its various forms, where it occurs, and how people respond. The topic has received a good deal of attention over the past year, first from journalists documenting their experiences with hostility online, then to the aftermath of hacked celebrity photos, and most recently the controversy surrounding #Gamergate. Online harassment presents some challenges to researchers, policy-makers, law enforcement, and advocates who urge more attention to the issue. For instance, there is little consensus on the definition of online harassment (legal or otherwise), as well as who should be responsible for monitoring bad behavior online. The U.S. Telecommunications Act of 1996 does not hold websites responsible for content posted by users, leaving technology companies to create and enforce their own community standards. Our research focused on the broad landscape of online harassment – from mild instances to severe problems. 1 40% of internet users have personally experienced online harassment. We defined online harassment as having had at least one of six incidents personally occur to someone: name-calling, efforts to be purposefully embarrassed, physical threats, harassment over a sustained period of time, sexual harassment, and stalking. (Respondents were separately asked if they had witnessed any of these behaviors occur to others online; 73% said they had). Online harassment fell into two distinct, but frequently overlapping, categories of severity – “less severe” harassment was composed of name-calling and embarrassment; 22% of internet users exclusively experienced this kind of harassment. Another 18% of internet users experienced any of the “more severe” types of harassment, including physical threats, sustained harassment, stalking, and sexual harassment. 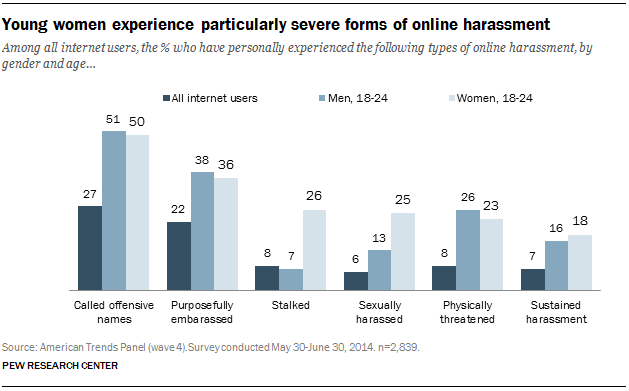 2 Young adults are the most likely demographic group to experience harassment online. Some 65% of internet users ages 18-29 have experienced some type of online harassment. The youngest internet users, those ages 18-24, are not only more likely to say they experience online harassment overall (70% say they’ve been victim of at least one type) but also significantly more likely to say they are targets of some of the more severe kinds of harassment like physical threats (24%), sexual harassment (19%), and harassment over a sustained period of time (17%). 3 Men and women have different experiences with online harassment. Online men are more likely to experience at least one of the six types of harassment we queried – 44% have had some sort of harassment experience compared with 37% of online women. Men are somewhat more likely to experience certain “less severe” kinds of harassment like name-calling and embarrassment. They are also more likely to receive physical threats online. Women – and particularly young women – are more likely to experience certain types of “more severe” harassment, such as stalking and sexual harassment. Among female internet users 18-24, 26% say they have been stalked online and 25% have been sexually harassed. This is significant not only to their male counterparts of the same age, but also to women just a few years older, 25-29. In addition, young women do not escape the heightened rates of physical threats and sustained harassment common to their male peers and young people in general. 4 Half of those harassed online do not know who is behind it. When asked who was responsible for their most recent incident with online harassment, 38% said it was a stranger and 26% said they didn’t know the real identity of the person. Among known perpetrators, acquaintances and friends were the most common types cited, 24% and 23%, respectively. 5 Social media was most frequently cited as the scene of online harassment. When asked to think of where their most recent incident with online harassment occurred, 66% of those who have been harassed cited social media websites and apps. Some 22% noted the comments section of a website, while 16% each noted online gaming or personal email accounts. Some 10% said it happened on a discussion site like reddit, while just 6% noted online dating sites and apps.